For those of you curious about what's next for me, I should probably tell you about MY LADY JANE. It's coming out on June 7, 2016, published once again by the wonderful HarperTeen, and it is quite possibly (cover your ears, UNEARTHLY and THE LAST TIME WE SAY GOODBYE, Mama loves you, too) my favorite book that I've ever written. Writing THE LAST TIME WE SAY GOODBYE was difficult. It was a subject that had been tumbling around in my brain for a while, and it felt important to talk about, but I knew from the start that writing it was going to just about kill me. It was so hard, and there were so many days I wept copiously at my keyboard, but I did it and I was so glad I did. I am so proud of that little book. It's my heart's truth, right there on the page. But needless to say, it took a lot out of me. I went into a bit of a funk after I finished writing THE LAST TIME WE SAID GOODBYE. So I needed something else. Something that would be a joy to write. Something to make me laugh. At this point I'd been talking for more than a year with my friend Brodi Ashton (author of the EVERNEATH series) about writing a book together. I had this strange little idea that we could retell the tragic story of the Lady Jane Grey. If you know British history, you'll know that LJG was "the Nine Days Queen," as she was the queen of England for nine(ish) days in the year 1553, before Mary Tudor kicked her off the throne and had her beheaded. I thought we could rewrite Jane's story. . . as a comedy. And Brodi Ashton had the best comedic sense of any writer I knew. So it made sense to team up. You should have seen the look on Brodi's face while I was trying to pitch her this idea. We were having lunch at Cafe Rio. 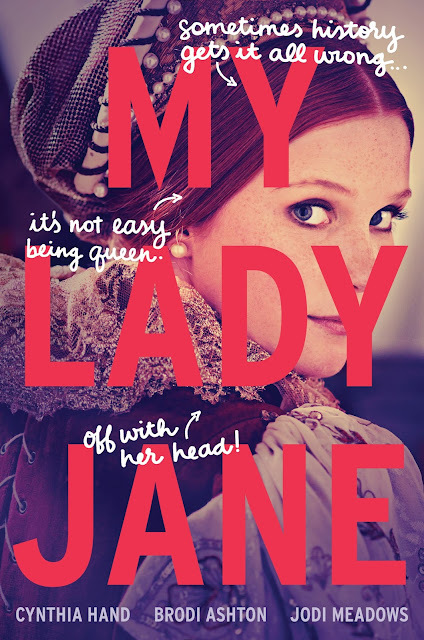 I was yammering about how great the real Jane was--a book nerd even before book nerds were a thing, so smart and passionate and awesome, and how dare she get her head chopped off, a girl like that! We could write an alternate version, and we could write it so Jane lives! We could use magic in place of the religious elements of the real story! Then I started talking about this idea I had that maybe our magic could be that people turned into animals, and maybe Guildford, the guy Jane was forced to marry, could be cursed to spend his days as a horse, wouldn't that be funny, and then the story would kind of be like THE PRINCESS BRIDE and like SHREK and like LADY HAWKE and there's not really anything like that in YA, right, so it'd be so cool and it'd be funny and it'd be a blast to write, don't you think? I am not great at pitching. Kudos to Brodi for keeping her face so carefully blank as she ate her salad and listened to me go on and on about how awesome it was going to be. "Sure," she said a the end of this conversation. "Sounds like . . . er, fun." We didn't talk about it again for, oh, about six months. This time we were hanging out in Virginia with our friend Jodi Meadows. Somehow I got on the subject of this awesome novel about the Lady Jane Grey that Brodi was going to write with me (you're still going to write it with me, right Brodi? Right?) and Brodi turned drowning eyes to Jodi, hoping our friend would say something reasonable like, "Hmm, Cynthia, a comedy about a famous beheading? That seems a little far-fetched." Instead Jodi said, "That sounds amazing. There's not much comedy in the YA fantasy market." And I blurted out, "Hey, you write fantasy. You're funny. Would you like to write it with us?" And Jodi (poor, dear Jodi) said yes, why yes she would. And Brodi looked relieved that now she wasn't the only person who'd been fool enough to agree to such a thing. Fast forward six months. California. Jodi and Brodi were visiting to do a couple of events in Los Angeles and talk to my novel writing class at Pepperdine. And what did I keep bringing up, over and over and over again? That novel about the Lady Jane Grey. Sometimes I can be like a dog with a tooth in a towel, I tell you. There was a free day in the middle of that week. We were thinking about going to Disneyland. "But instead, we could stay home and start writing this Jane Grey novel," I suggested cheerfully. "I mean, we could go to Disneyland any old time, but how often could we write a book together? And maybe there are three characters, and we could each write one and rotate chapter to chapter." And that's how MY LADY JANE was born. Because I shanghaied my two besties into writing a book with me instead of spending the day at the happiest place on earth. But it worked out, because now that book is a REAL book, and it's going to be out this summer. We'd get up, eat breakfast, shower and get coffee. We'd spend the morning writing and brainstorming and giggling to ourselves at our own jokes. We'd write hard all through the afternoon and finish our individual chapter. We'd sit around the living room with our laptops and read our day's chapter out loud to each other, and we'd laugh and laugh. Sometimes we'd laugh until we'd cry. We'd make suggestions. We'd plot. We'd plan for what we'd write the next day. We'd stay up late talking. And then we'd get up the next morning and do it all over again. It was the most fun I'd ever had writing anything. It was exactly what I needed. Fun fun fun. At the end of that week we had twelve chapters of a novel, and we'd fallen in love with the story of Lady Jane Grey. A comedy. An adventure. A fantasy. A story about friendship and loyalty and love and being true to yourself. It's so good, you guys, the best book I've every written a third of. Seriously. And the best part is that now I get to share all the joyful fun with all of you. If it sounds like MY LADY JANE is going to be up your alley, please check out our website, The Lady Janies for more information about where you can pre-order the book and join our new fan club. Trust me. It will be good for a laugh.